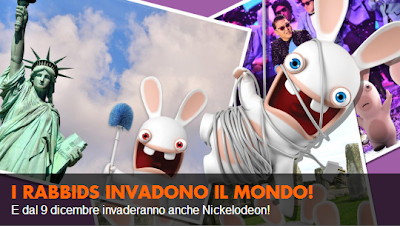 UPDATE (Sunday 8th December 2013) - Nickelodeon Italy will premiere "Rabbids Invasion" on Monday 9th December 2013 at 5:30pm! Nickelodeon Italy (Italia) has announced the exciting Nickelodeon Europe News in the news slider on the homepage of their official website that Nick Italy will start to premiere and show Nickelodeon and Ubisoft's brand new CG-animated series "Rabbids Invasion" from Monday 9th December 2013 at 5:30pm (17:30) as part of the channels Winter 2013 highlights! E dal 9 dicembre invaderanno anche Nickelodeon! THE RABBIDS INVADE THE WORLD! And from Dec. 9 invade even Nickelodeon! 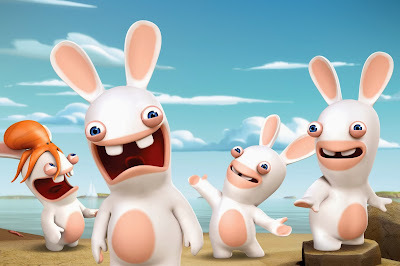 To celebrate the Italian debut of "Rabbids Invasion" on Monday 9th December 2013, Nick Italy has unveiled the networks brand new official "Rabbids Invasion" webpage, which you can visit here at nicktv.it! Nickelodeon Italia's all-new "Rabbids Invasion" show website features information about the brand new show, a 'Meet the Characters' ('Personaggi') section featuring bios and animated GIF's of each character in the series, a exclusive online game called "Caccia Al Rabbid" ("Hunt for the Rabbid"), and a photo gallery featuring pictures of the "Raving Rabbids" taking over the world (Planet Nickelodeon / Planet Orange)! Follow NickALive! on Twitter, Tumblr, Google+, via RSS, on Instagram, and/or Facebook for the latest Nickelodeon Italy and "Rabbids Invasion" News!